This pattern is for personal use only, please do not copy, use or claim for your own any of my photos, descriptions or wording. Wearing this hat may cause uncontrollable urges to crinkle your nose, make an evil smirk with your mouth and give everyone that evil eye. Consider yourself warned. I was thinking about making the horns fatter, BUT I made a rockstar Twi'lek hat that has really long lekku and the weight of them make the hat a bit of a nuisance (not that it stops me from wearing it in public). So, I went with horns like this, and I'm also glad that it makes it just a tad different than some other famous evil lady because I wanted this hat to be more personal....and I wasn't feeling 'wide' today. sc in 6 sc (you may add another round if you want a longer beak-leave a long tail for sewing. When you attach your beak to the head, using the grey tail from beak, sew French knots for eyes. 2.-5. ch 1, sc in each sc, then finish off and leave a tail for sewing. Sew to under belly of raven for your finger to to into. Fold the hat exactly in half with the FPDC rounds in the very center front. Place a stitch marker in each corner. You will be starting an ear flap at each of these stitch markers (one on will start on the right side the other will start on the wrong side-both are to be worked toward the back of the hat). If you want to make your ear flaps longer and then put a button on them so they join under your chin, please do so, I don't like that personally as I feel like I am gagging. For the horns we are not going to be counting rows or keeping track of rounds. Rather, I have just numbered this into ‘steps’ so it is easier to follow. lightly stuff horns and attach to top of hat. Dragonbird, this is Softywares. This little birdy is fabulous, and the hat is pretty great too. 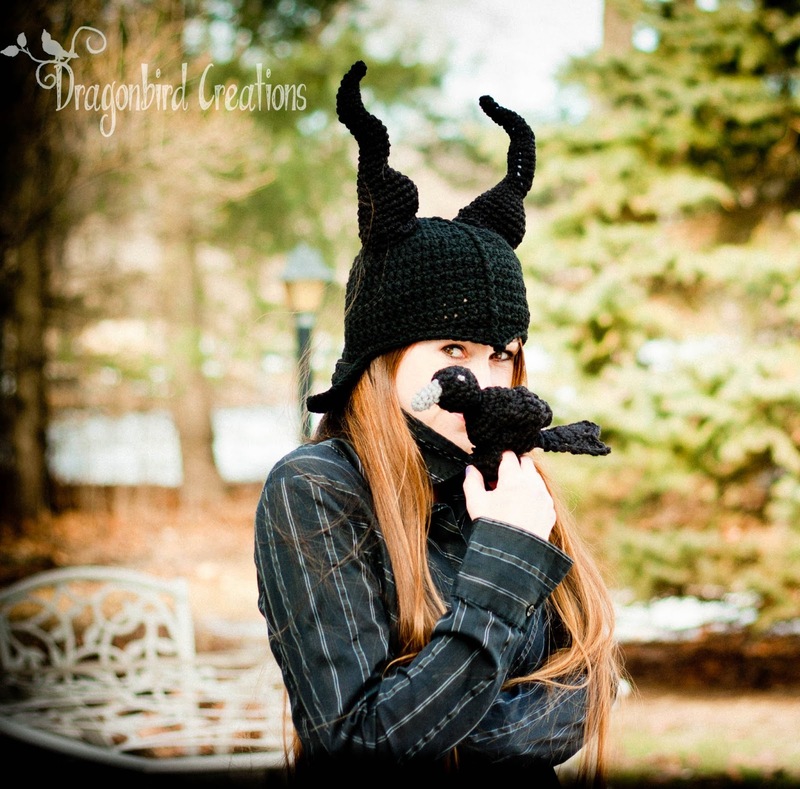 I have been a big fan of Dead Crow Hat; it's in my Ravelry library. I plan to make this bird, but he'll be wearing boots, or maybe sneakers. Regards. 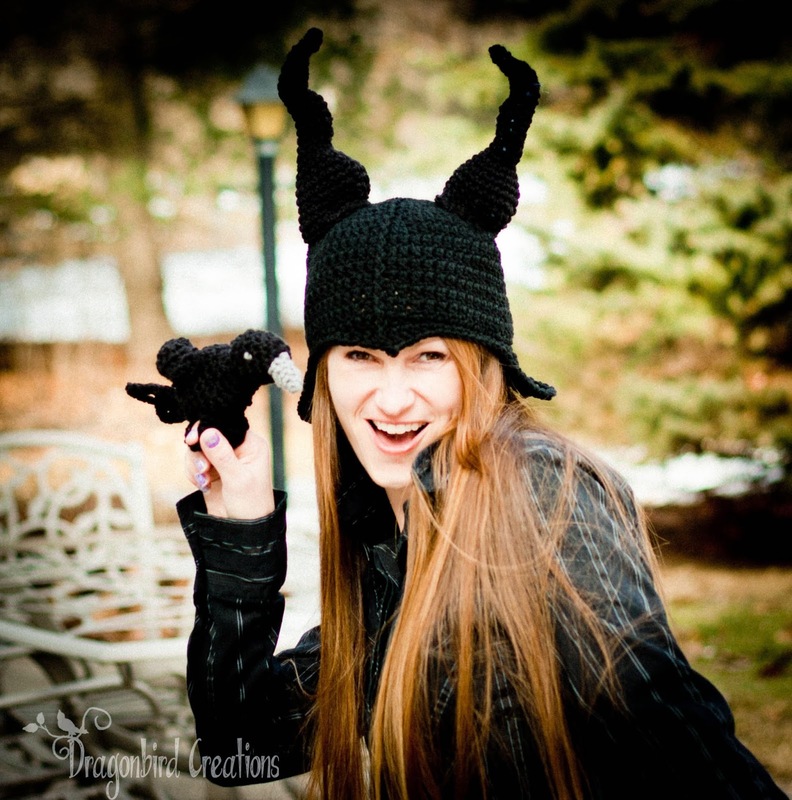 Today I was planning on finishing some projects but I see this hat and crow so I must start them today! I am a huge fan of Disney Sleeping Beauty plus I can't wait for the new movie Maleficent. Thank you for the free pattern. ;) I have a few projects that I still need to finish as well...My problem is that once I start something new the old one begins is death spiral....Good luck on all you have on your plate! :) I'm very excited about the new movie coming out. Sleeping Beauty was always my favorite as a kid and Maleficent was always the baddest of the bad. ;) You gotta love evil when it's done right. Question? What is a FPTDC? Front Post Triple Double Crochet....It means you will put your hook behind and then around the post (instead of into the top loop) indicated, and then complete a TDC as you normally would. Ok. I know how to find a double triple crochet. Have to find tutorial for triple double crochet. Pretty sure it is the same thing-basically it is just like a dc you just YO twice and work it off an extra time. We are headed to the Disneyland 24 hour all night event. My 10 year old son wants to wear Maleficent's horns. This pattern is awesome. My son has a head full of locks. He needs a big hat. This is totally adorable. I'll have to make it. Oh, btw, what is the name of the font in the heading of your post? Thanks. Glad you like it! :) I'm not sure which font you are talking about? The very top one is called Crafty Girls (available as a choice on this site) and the little bolder parts of the actual pattern are Janda Apple Cobbler (which I downloaded from DaFont). Janda Apple Cobbler - that's it! I like the other one, too, but I've got one almost like that. You are my kind of wacky, Dragonbird. Thank you so much for your generosity in sharing your beautiful creations. Can you explain what you mean when you say "magic ring" in the first step of the hat? Is the hat done in g or h hook?